Development Type: New construction rental flats and townhouses, 4 barrier-free units, and historic preservation of former "livery." Resident Profile: Mixed-income, mixed-age, mised able and diabled persons; 25% low-income, 50% moderateincome, 25% market-rate. Construction Site: Two-story wood fram, horizontal siding, composition shingle roof. 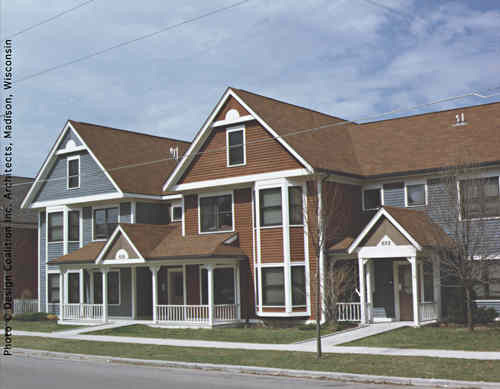 The Reservoir is a resident-managed, limited equity cooperative designed for families, and singles. It consists of 28 units arranged in two-story flats and attached townhouses, with a number of units specifically designed to accommodate people with disabilities. The density of 20 units per acre matches that of surrounding neighborhood as do the street setbacks, roof shapes, building widths, bay windows, and building materials. Wood construction was used throughout except for the historic brick livery stable on the site, which was retained and remodeled to contain two apartments, a laundry and meeting space for the complex. Buildings were grouped to provide the largest possible back yards, community gardens, and two playgrounds. Two parking lots are located within short walking distances of the units so that cars do not dominate the site. In respect to security, all parts of the site are visible from within the units, and the residents supervise the commons as communal space. The City of Madison owned the site and offered it to developers who would meet the city's development and design criteria, which became strong determinants of the site planning and design. The nonprofit owner-architect team, Madison Mutual Housing Association (MMHA) and Design Coalition, Inc., were required to compete with for profit developers. The site was six blocks from the state Capitol and the downtown business district between and underutilized industrial area with a rail corridor and a neighborhood occupied by working class and student population. Subsequently the use of the marshy site as a landfill for building materials made it necessary to excavate the site and haul in new soil. The new housing not only made a positive use of long vacant land but also sparked rehabilitation efforts on adjacent blocks. In the last five years for profit developers have added about 150 more units both in rehabilitated warehouses and new construction. At the outset, community support was divided--the antagonists outnumbered the advocates. 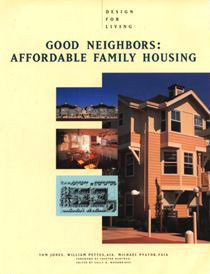 The development faced strong opposition because neighborhood residents were concerned about the effect on the neighborhood of the families with low incomes who would move in. This situation changed during the design process to which the owner invited opponents to The Reservoir, residents of the Mutual Housing Association's other coops, representatives from local nonprofit serving older adults and persons with disabilities, and neighborhood residents. The two major changes that neighborhood concern brought about were the reduction of units from 40 to 28 and more parking. Susan Hobart, former executive director of the Madison Mutual Housing Association, believes that the additional months of planning committee meetings were key to the eventual acceptance of The Reservoir, and improved the overall buildings and site design. Lou Host-Jablonski, one of Design Coalition's architects, commented that, "in my experience much more thought, and care, and energy was lavished on the The Reservoir than is typical of conventional, market-rate housing. The latter is typically easier because it attempts little that is new. In fill affordable housing projects like this one present a more complicated political context, financial complications such as many sources of funds, overlapping and sometimes conflicting requirements, tight deadlines, and greater scrutiny by the community and governing officials. The Reservoir could not have been accomplished without a strong, committed and clear-minded client".